Killing groups 1 and 3 and collecting the militia from the transport completes the mission objectives. All ships in both groups must die; collecting the militia is not enough. Don't forget to pick up the 10 Militants from the Personnel Transport Wreckage! The mission groups need to be updated as of 8/5/2008. Replacing some of the frigates in the first and second waves are Gistior Haunters, based on Minmatar Thrasher destroyers. There are 2 in the first wave, 5 in the second. Angels now have a resistance to Explosive damage, heavy missiles will do less than half damage on most of the mobs during this mission. I was able to aggro and take out each group in turn by firing a few shots at one ship in the group, without the other groups aggroing (group 1 first, then group 2, then group 3). 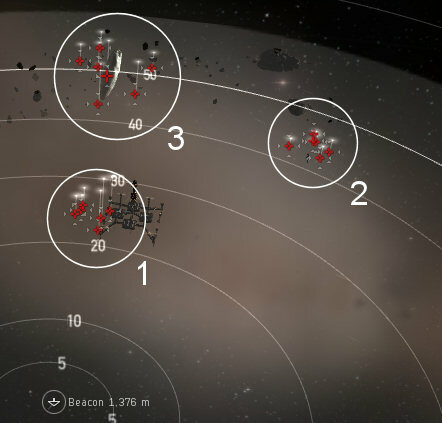 I orbited the beacon, and as each group aggroed and came towards me, released a flight of 5 Hornet II drones, which tore through the ships in no time at all. At least two of the Gistii Ruffians in group 3 used target painters, but as very few of the ships lasted long enough to get in range, that had little impact. I did this mission in a Vexor, but took so little damage that pretty well any ship with a decent targeting range (e.g. 50km+) and capable of carrying 5 light drones (you want a drone control range of 40km+) would have been suitable.